Typically thought of as the finicky kingpin of office foliage, replicated and forever memorialized in plastic, Ficus is actually a genus with more than 850 different varieties of trees, shrubs, and vines. The Latin word ficus, loosely translated, means fig, and that delicious, sweet fruit found growing in Charleston gardens is a relative of this versatile superstar. Whether you want to grow them inside or out, there is a ficus variety to suit every style and need. Looking for an evergreen vine to climb a vertical space in the garden? This vigorous grower grips surfaces with its strong aerial roots and can be used to soften a stark stone or brick wall. This does come at a price. It will require sheering back three to six times a year. Left on its own, creeping fig can climb to 20 feet or more and produce a small, inedible fruit. It can also be trained indoors on a topiary form. This plant gained a bad rep for demanding exacting care, probably due to over-watering, scorching sun, and general neglect. In truth, it can be maintained happily as a container plant for years. Train this variety as a tabletop topiary or grow it into a large tree—it’s known to reach up to 100 feet in Asia and Australia. It thrives in bright, indirect sunlight at temps around 75 degrees. Place it near a window, away from drafts, as this may cause leaves to drop. 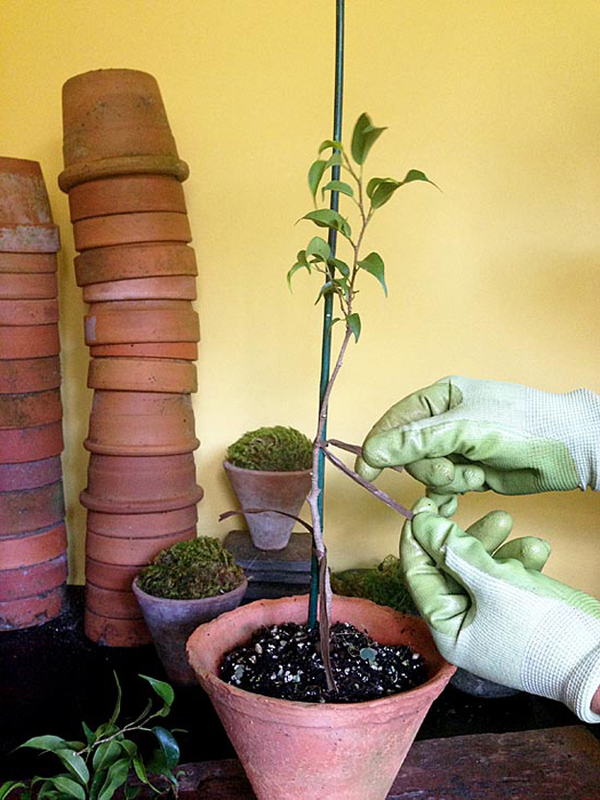 This plant does not mind being root-bound and can handle heavy pruning to maintain its size. 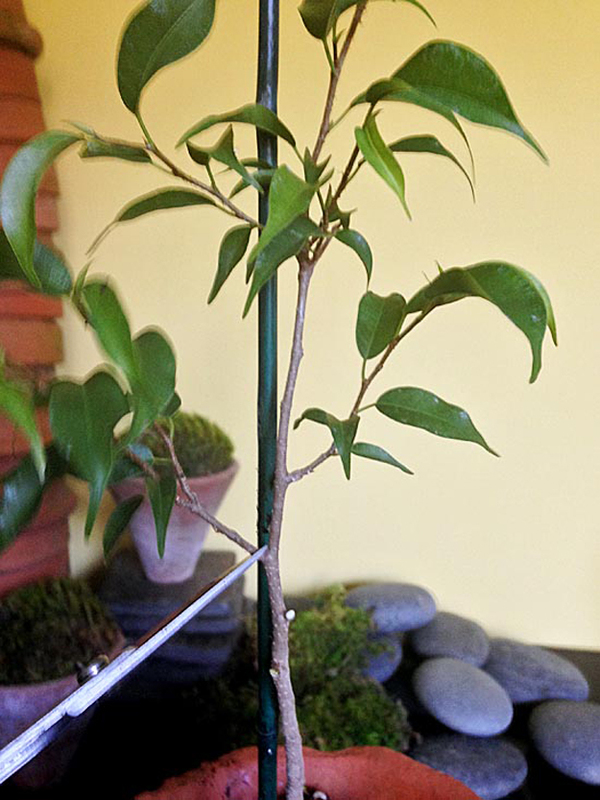 Growing a ficus topiary is a fun and easy project that can be enjoyed for years. Follow these step-by-step instructions to get growing!not nearly as sensitive to temperature changes. 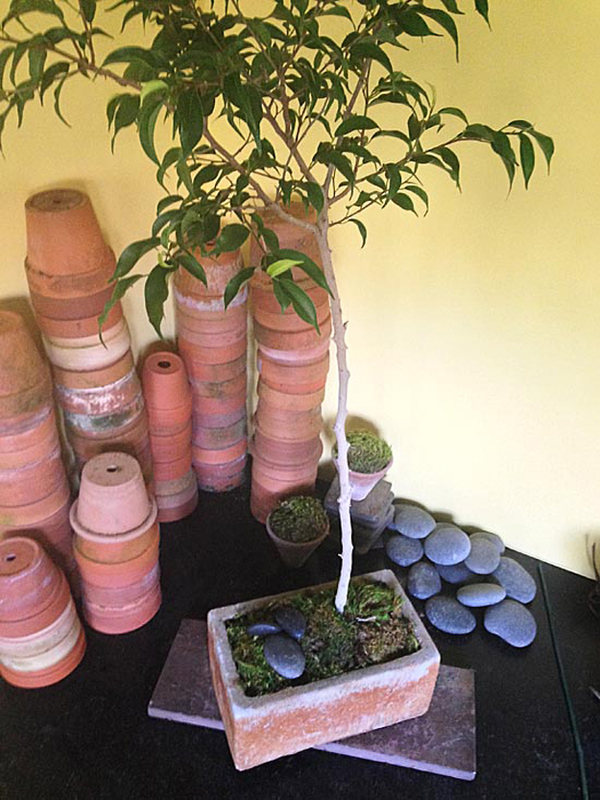 Growing a ficus topiary is a fun and easy project that can be enjoyed for years. 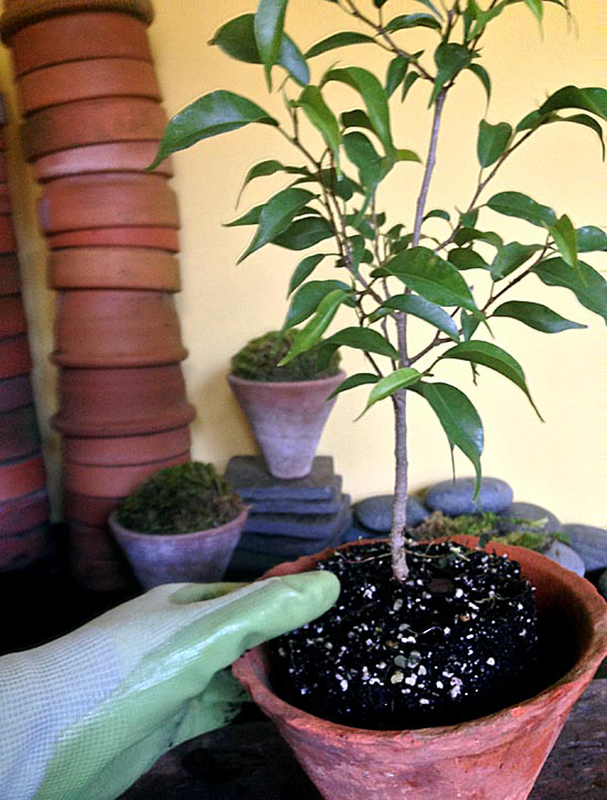 Follow these step-by-step instructions to get growing! 2. 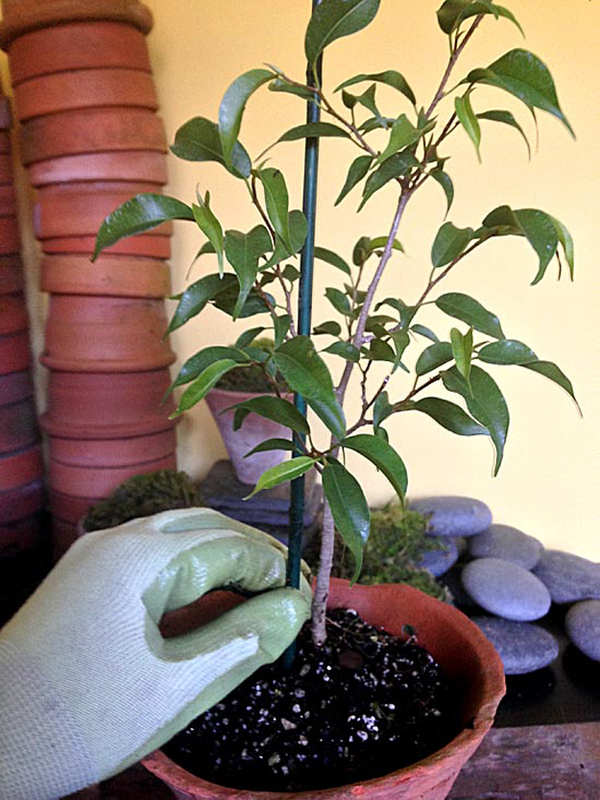 Plant ficus in container with nutrient-rich potting soil and water thoroughly. 3. Place plant stake as close to the trunk of the tree as possible. Be sure that the stake is pushed all the way down to the bottom of the pot for stability. Don’t worry about hurting the Ficus roots they will be fine. 4. Use snips to prune horizontal limbs back to make one central leader. This will channel the plants energy into growing vertically. 5. 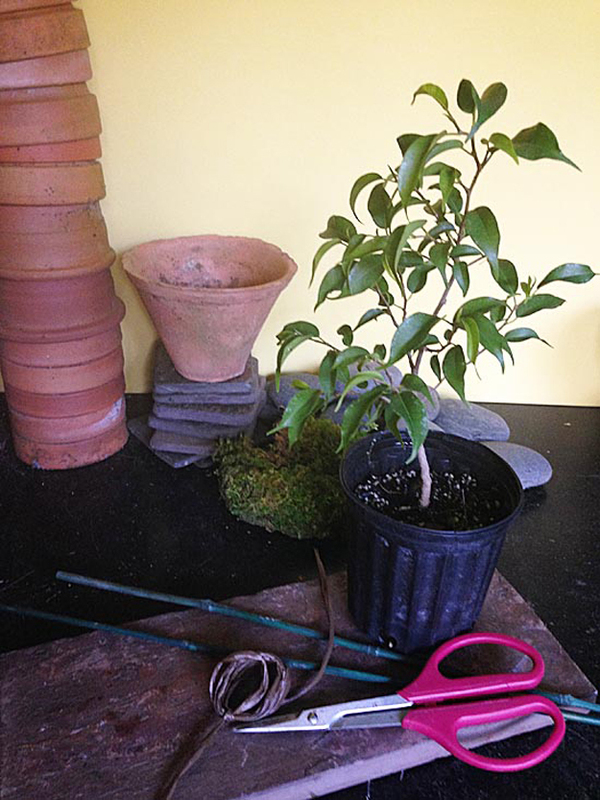 Secure Ficus to plant stake using twine. In this photo brown raffia is used to blend with the trunk. Tie at the base, midway and additionally close to the top. 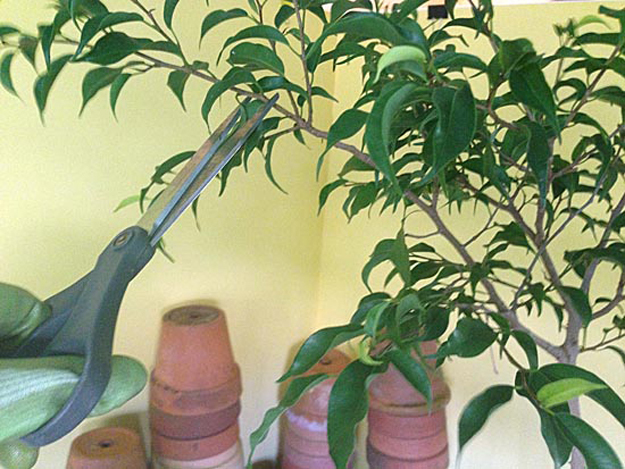 As the Ficus grows, continue to prune horizontal limbs and secure to the plant stake until it reaches preferred height. 6. Once it has reached the height that is desired, let the canopy grow. Prune back to shape, this will encourage foliage density. 7. Apply the finishing touches. Top dressing your containers for interior display - this is the icing on the cake! 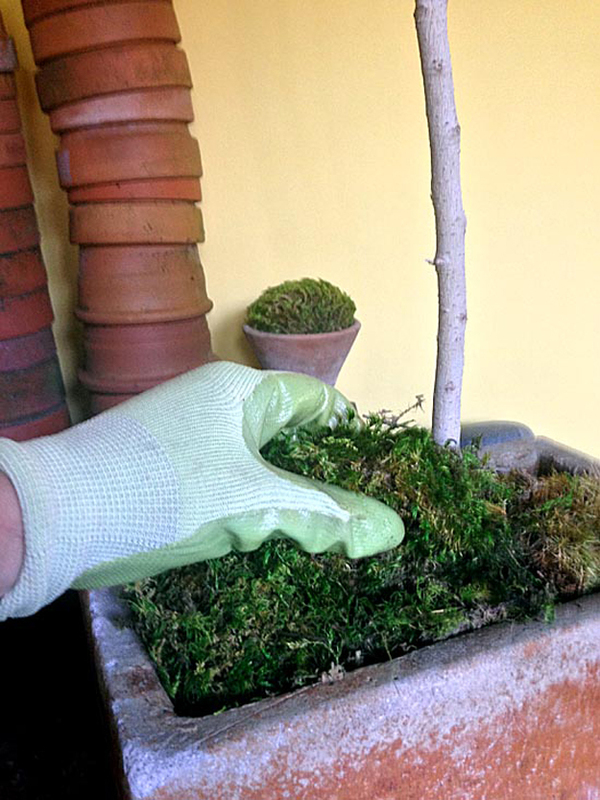 Use “mood moss” to cover the soil line and dress the container. Find a favorite rock to add an element of scale. 8. Most of all enjoy the process of growing!